I am fairly certain that kombucha has become popular enough so as not to require a formal explanation, but just in case you are new to this activity or would like to find out more, you can learn plenty about what exactly kombucha is, why you might be interested in making it yourself and why you probably should right HERE. This was my initial guideline and set of instructions that I have used for my batches and they have all turned out wonderful.No matter what you are adding to the kombucha, the process is more or less the same. I should point out however that it is definitely NOT a good idea to steep ingredients such as herbs and spices such as cloves, ginger or cardamom in your kombucha without removing your culture first. These and many other herbs, spices or other plant parts have anti-bacterial and anti-microbial properties which make them powerful medicines to combat disease and infection but could be lethal to your culture of bacteria and yeast that make kombucha. Therefore it is always a good idea to do some research about what you are adding to your kombucha before you actually do so to avoid any possible trouble with your culture. This week’s batch of kombucha features two particularly unconventional ingredients that I am hoping will produce something remarkably unique and healthful. In autumn 2013, I harvested the last of the rhubarb stalks to emerge before the weather cooled down enough to tell the plant to slow down vegetative growth and prepare for the upcoming winter. I didn’t plan on using the rhubarb stalks immediately, so I chopped them into manageable pieces and frozen them in the hopes that they would come in handy, which they most certainly did. The second ingredient that I decided to include were some chokeberries, which are the fruit of the black chokeberry bush, Aronia melanocarpa, a native of eastern North America (although I’m not really sure specifically where in eastern North America, as I have observed this species planted as part of riparian restoration efforts in regions where I have never seen this species occur in the wild, including where I harvested these particular berries along the waterfront trail in Hamilton. Despite possibly not having naturally grown in this part of Ontario, the planted shrubs are doing very well indeed and were bending over under the weight of their own tightly packed clusters of progeny in late August). The berries are dark purple or almost black and are about the size of blueberries when ripe, except they are produced in terminal clusters at the ends of branches. Besides A. melanocarpa there are other species which can be found in many parts of North America, some of which have red-skinned fruits. They are extremely juicy (the juice contributes to the ever-so-pleasant purple-finger-syndrome during harvesting), rich in pectin, vitamin C, polyphenols and antioxidants but are astringent rather than sweet and produce a dry, puckering sensation in the mouth if consumed in any quantity. This feature is what gave way to the appropriate but unfairly negative name of chokeberry and made them fall under the radar of sweeter fruit such as blueberries, currants and june/saskatoonberries (Amelanchier spp., particularly A. alnifolia). With all of this considered, I feel that just because chokeberries aren’t sweet doesn’t mean that they still aren’t good for you and can taste wonderful if combined with complimentary ingredients. I’m hoping the astringency will balance the sweet and sour tang of the plain kombucha and rhubarb and produce a delicious, complex beverage that stimulates all 3 of those taste receptors to produce something full and lively. Below is the standard ingredients and steps that I take to make my personal version of kombucha, but of course this recipe is extremely flexible and I encourage you to look up different ways that other people are brewing it and to fool around until you find a method that works and tastes best to you. 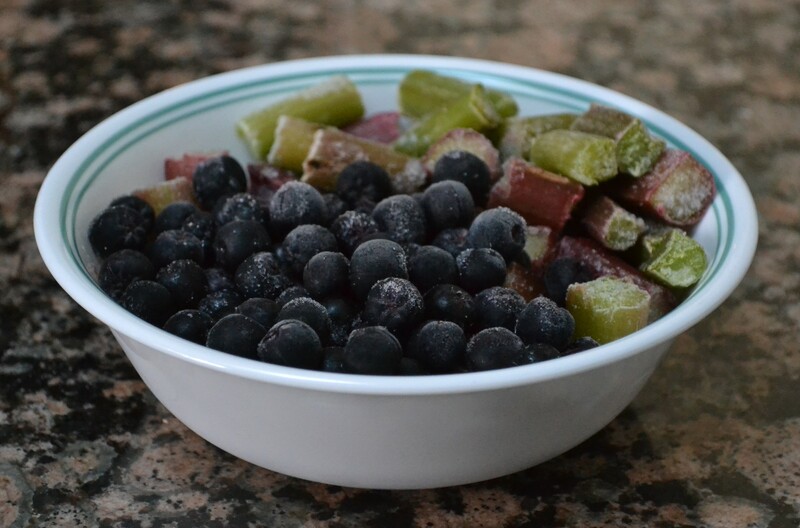 – 2 cups each chopped rhubarb and whole chokeberries, fresh or frozen. 1) add green tea and sugar to fermenter and pour in boiling water. Allow to steep for 15 minutes. Strain green tea leaves. 2) pour tea and sugar mixture back into fermenter and top off with cool water until a total of 1 gallon is reached. Stir to incorporate. 3) once the liquid is near or at room temperature (at least below 30°C) add your culture. 4) stretch cheese cloth / coffee filter or other porous material over the top of your fermenter and secure with rubber band. 5) allow to fully ferment until desired level of sweet-sour flavor is achieved, between 1-3 weeks. 6) remove culture from your now finished, plain kombucha and place in new batch of sugar and tea or inside a sealed container with at least enough plain kombucha to complete cover the scoby. Do not leave in this container for more than a week. 7) add chokeberries and rhubarb pieces to the brewed kombucha. Let steep for a few days, until desired flavor is achieved. 8) strain ingredients and pour into glass bottles and cap. Wait 3-4 days until carbonated and refrigerate. Drink within 1 month.